Truly deserves a place in your kitchen. 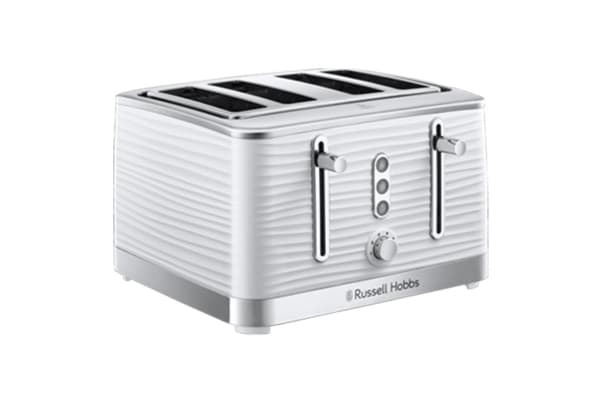 Make a stunning statement on your kitchen counter with the Russell Hobbs Inspire 4 Slice Toaster. Be drawn in by its unique design of entrancing, textured ripples that endlessly wrap around every aspect. With 4 large slots, the Russell Hobbs Inspire 4 Slice Toaster is the perfect size to bond over breakfast with those that matter the most. Combining a premium textured plastic with strong stainless steel accnts – this toaster adds a touch of class to any kitchen. So switch off from the world, push down the lever and get back to truly enjoying life with a delicious breakfast and great company.